Best Books for Preschoolers - They will love it! If you have a preschooler at home, maybe you’re not sure what he or she should read. Here are our picks for best books for preschoolers! You can also check our list of 40 best books for toddlers! A brand-new interactive Dot and Dash book! Dot loves to dance. Dash loves to sing. Big, Tall, and Small clap very loud! Dot and Dash bow and beam. More than anything, Dot and Dash love their friends. Dot series are great books for preschoolers. Eugene Trivizas’s hilarious text and Helen Oxenbury’s enchanting watercolors have made this delightfully skewed version of the traditional tale a contemporary classic. Boynton is back! Joining Barnyard Dance! and Birthday Monsters!, here is Pajama Time! a good-night book with the irrepressible language, the inimitable illustrations, the irresistible cast of characters only Sandra Boynton could create. Hilarious hippos make a party out of counting in this Sandra Boynton classic. Here is the classic Boynton counting story in a sturdy, board book version. Perfect for travel time, bedtime, or PARTY TIME! Some books for preschoolers can teach us a lot. There is a wonder and magic to childhood. We don’t realize it at the time, of course . . . yet the adults in our lives do. They encourage us to see things in the stars, to find joy in colors and laughter as we play. Do you like cool books for preschoolers? It’s an exciting day for Llama Llama; he’s going to visit Gram and Grandpa Llama and spend the night! His first night away from home….and from Mama. But he makes sure to pack everything he needs. And there are so many fun things to do with Gram and Grandpa. It’s not until he gets ready for bed that he realizes that he’s forgotten something important. Fuzzy Llama! Fortunately, Grandpa Llama has a wonderful solution and soon Llama Llama is having sweet dreams. Every day the boy would come to the tree to eat her apples, swing from her branches, or slide down her trunk…and the tree was happy. But as the boy grew older he began to want more from the tree, and the tree gave and gave and gave. Amazing books for preschoolers! Another cool book on our list of books for preschoolers. A mouse is taking a stroll through the deep, dark wood when along comes a hungry fox, then an owl, and then a snake. The mouse is good enough to eat but smart enough to know this, so he invents . . . the gruffalo! As Mouse explains, the gruffalo is a creature with terrible claws, and terrible tusks in its terrible jaws, and knobbly knees and turned-out toes, and a poisonous wart at the end of its nose. But Mouse has no worry to show. After all, there’s no such thing as a gruffalo. . . . The preeminent children’s book artist of the twentieth century, Maurice Sendak and his sixty-year career are celebrated in this full-color catalog of more than two hundred images being exhibited at the Society of Illustrators in New York City from June 11–August 17, 2013. His books for preschoolers are amazing! 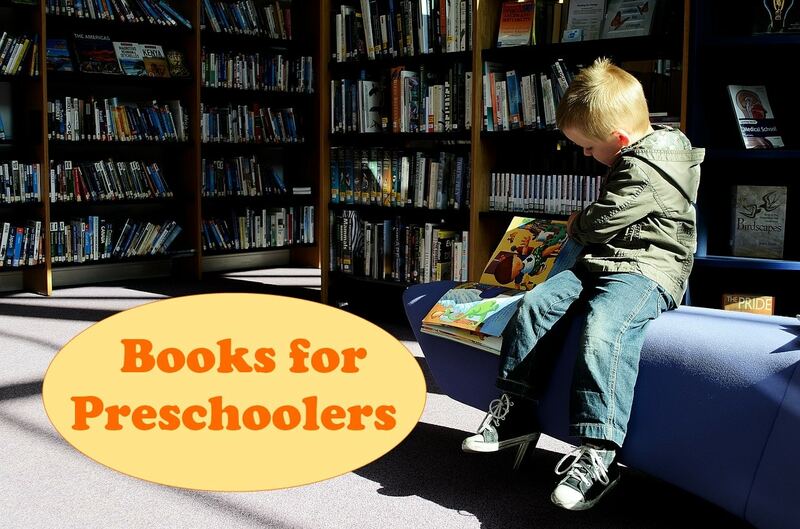 What are your favorite books for preschoolers? Share with us which books will be on your ‘books for preschoolers’ list! *And just for full disclosure, there are affiliate links in post ‘Best Books for preschoolers’. This means that I’m sharing books for preschoolers that I like, and if you make a purchase through the link, I earn a little bit back. No extra cost to you, and just a little help for me to pay for the blog expenses. Great, great options. We have a once a month trip to Barnes and noble to pick up some books, it’s good to know the options before hand. I remember reading some of these as a kid. I personally LOVE the llama books!! They are truly my favorite! Great post. We have a few of these, but now I know some books to add to the list. Great list! We already have a few on this list (like Chicka Chicka Boom Boom) that my daughter really enjoys. I’ll have to check out more of these! Wonderful list! Thanks for sharing with us at Mommy Monday! Thanks for sharing this books list for Hearth and soul blog hop, I will check in the library for my little guy, pinning and tweeting. I LOVED The Giving Tree while I was growing up! My son or daughter will definitely have quite a few of these when I have one! Thank you for linking up with us at the Tips and Tricks Link Party! I hope to see you back this week!